An Ordinance is in effect in unincorporated Winfield Township that prohibits parking on roads or the road right-of-way at anytime. Ordinance #2013-07 was adopted November 18, 2013. The Township has chosen to enforce this ordinance due to parking conflicts with safety and emergency vehicles. Parking Violations will be issued to vehicles and/or other equipment parked on Township roads or the road right-of-way. The $50.00 fine can be paid by mail in the envelope provided or in person at the DuPage County Clerk of the Circuit Court, 505 North County Farm Road, Wheaton, IL 60187. Temporary parking permits will be issued for special occasions only and must be arranged at least three days in advance by calling the Winfield Township Road District Office at 630-231-8850. 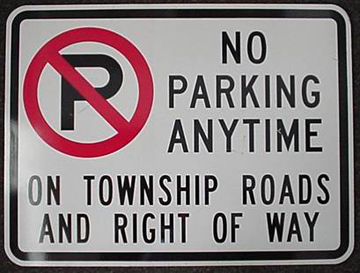 Township road right-of-ways are not to be used for parking of trailers, boats, campers, etc. These items are to be stored on homeowner’s property in accordance with the DuPage County Zoning Regulations. Clic aquí para obtener información sobre la regulación de la calzada. The Township will often post an area by subdivision using a sign similar to the one shown above. Streets that lead into a subdivision will be posted with this sign or one similar to it and the no parking ordinance applies to all the streets within a given subdivision. Vehicles parked in violation are subject to being ticketed. Vehicles which are marked “For Sale” are also not allowed to be parked on Township Road Right-of-Way.